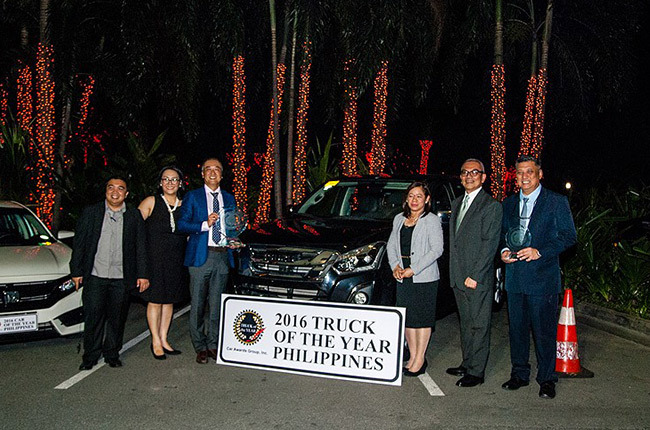 After strict technical evaluation by experts, Isuzu Philippines Corporation's (IPC) pick-up truck was recognized as the 2016 Truck of the Year – Philippines. Moreover, the D-MAX 3.0L 4x2 LS AT was also named the 2016 Best 2WD Pick-up Truck in the country by the Car Awards Group Inc. (CAGI). Also, came out as the D-MAX's counterpart was the Honda Civic RS Turbo CVT, which was named the 2016 Car of the Year – Philippines. The awards gala was held last November 21, 2016 at One Rockwell East Tower in Makati City. Included in this year's testing for the awards were almost a hundred different models from all vehicle segments in the Philippines. The awards, according to CAGI president Robby Consunji, is the only one in the country that is based on instrumented tests used to gather real-world acceleration, braking, and handling performance evidence. He further noted that the awards will hopefully be a basis for consumers for choosing the right vehicle for their next purchase. For more information about Isuzu and its vehicles, visit the AutoDeal Car Brands page.